Sign in to Office 365 at https://outlook.office.com. If you don't see the Forwarding option, it may not be available for your account. Try using Inbox rules to set up forwarding. See Use rules in Outlook Web App to automatically forward messages to another account. If you keep a copy of forwarded messages, check your Office 365 account regularly to make sure you haven't exceeded your mailbox size limit. If the size limit is exceeded new messages may not be forwarded. To forward email from other accounts to your Office 365 account, add a connected account. 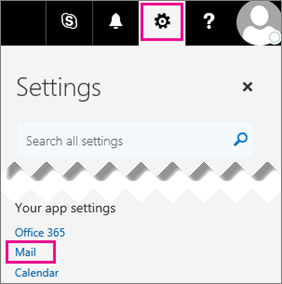 See Connect email accounts in Outlook on the web. 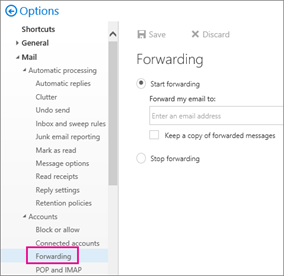 For information about how to set up forwarding using Inbox rules in Outlook 2013 and Outlook 2016, see Forward and redirect email automatically.